These MOOCs are moderated and taught with expert instructors. They use a case-based learning approach, and you will gain from the shared reflections and experiences of the other participants. Please join in to this exciting peer learning process help us and spread the word! The Congolese doctor Denis Mukwege received the Nobel Peace Prize 2018, together with Nadia Murad, for the efforts to end the use of sexual violence as a weapon of war and armed conflict. Congratulations! This is another example of a health worker using his professional competence, tools, and opportunities for preventing violence and building peace. Other medical peace professionals and organizations, having received the Nobel Peace Prize earlier, are: Albert Schweitzer, International Committee of the Red Cross and the League of Red Cross Societies, International Physicians for the Prevention of Nuclear War, Doctors Without Borders, International Campaign to Ban Landmines, and International Campaign to Abolish Nuclear Weapons. 3.400 students were enroled in the first two rounds of our MOOC (massive open online course) on the role of healthcare in maintaining and building peaceful societies. The course included two hours of training per week and helped to understand how violence affects health in multiple ways and how medical peace work has an impact on health, violence prevention and peace-building. Many participants came from UK, Germany, Canada, USA, Kenya etc. Join the Canadian Physicians for Research and Education in Peace (CPREP), and their partners for the upcoming PEGASUS conference at the University of Toronto. The conference aim is to advance awareness and knowledge of Global Health issues, locally and abroad framed through a lens of peace and sustainability. The conference will do so by bringing together physicians, health professionals, students, health-related organizations and community members to share their innovative ideas and concepts on the dynamics of Global Health and the socio-ecological determinants that impact health worldwide. For program and registration click here. 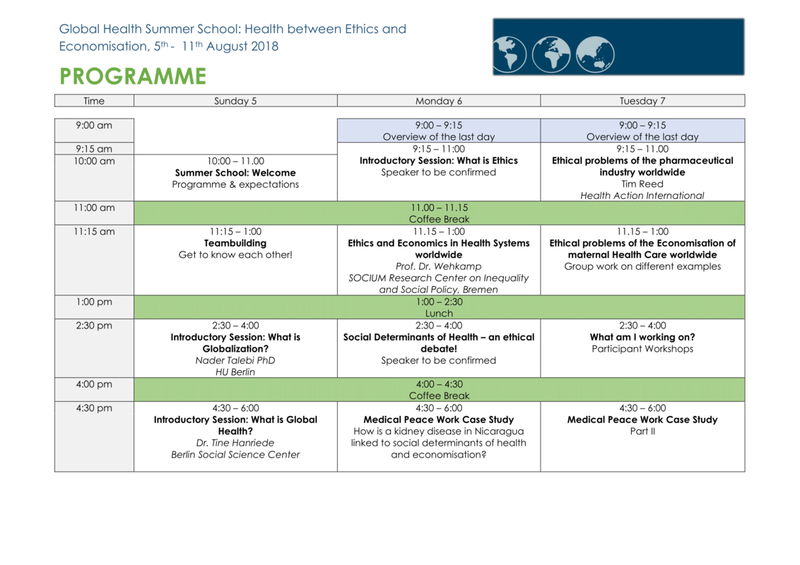 The Institute for Social Medicine, Epidemiology and Health Economics of the Charité and IPPNW Germany are hosts of the 8th Global Health Summer School Health between Ethics and Economisation in Berlin. This year's Summer School will take place from August 5th-11th. A one-day Alumni meeting and network conference will be held on August 4th. Students will conduct the Medical Peace Work Case Study 'The price of unhealthy working conditions: Sugarcane workers in Nicaragua'. On August 9, 2017, the journal „Medicine, Conflict and Survival“ published the article „Healing under fire – medical peace work in the field“ from Louisa Chan Boegli and Maria Gabriella Arcadu. Both authors have been instrumental in defining and launching the World Health Organisation´s Health as a Bridge to Peace programme in the 1990s, and are now involved in the MPW partner organization 4Change, whose focus is on the education of health professionals in reducing violence and performing peacebuilding actions. In their article, Louisa Chan Boegli and Maria Gabriella Arcadu write about lessons from a project in Southern Thailand and three asessments carried out in Myanmar, along the Syrian Borders and in Iraqi Kurdistan. Medact and International Physicians for the Prevention of Nuclear War (IPPNW), together with other partners, are organising the international congress "Health through Peace 2017: Confronting War, Militarisation and Global Insecurity as an International Health Community". The congress takes place from Monday 4th to Wednesday 6th of September 2017 at the University of York, UK. The congress will gather the health and peace communities for discussing the need for more effective peace building and greater levels of demilitarisation and social justice as preconditions for real human security. The congress will create a vibrant opportunity to learn about the root causes of violent conflicts and to find ways to reverse the recent upswing in violence, intolerance and tension around the world. With a range of partners, "Health trough Peace 2017" is also an opportunity to meet key academics, organisations and leaders in the peace, social justice and global health field. As part of the congress, MPW will offer a workshop on educating health workers for peace. Results from the first round of our MPW MOOC will be presented. In the run-up to the congress, the IPPNW student movement organises a bike tour from Faslane in Scotland – where the UK's Trident Nuclear submarines are based – to the congress in York. The tour starts on August 26th and ends on September 2nd. MPW MOOC - Open for registration! In collaboration with the University of Bergen (Norway), the European Medical Peace Work Partnership offers a massive open online course (MOOC). This new course introduces into the key concepts, opportunities and dilemmas in medical peace work by using six MPW online teaching cases in a virtual classroom setting. Beside of the case material the course contains readings, presentations, interactive exercises, and the feature of study groups and peer learning activities. This MOOC is built on the FutureLearn plattform and will be conducted in a moderated version over a period of six week (2 hours per week). European health groups launch six online teaching cases to educate nurses, doctors, students and others on the health aspects of violence, war and armed conflict. They will be presented at the Medact conference “Healthy Planet – Better World” on December 10th, 2016 in London. The cases are part of an educational series to help health professionals to engage in the identification and prevention of violence from the micro level (such as domestic violence, refugee discrimination, and torture) to the macro level (such as nuclear weapons, climate change, and war). These interactive videos and lesson plans complement twelve case studies which depict challenging situations for health professionals in preventing and reducing violence – as well as promoting peace, sustainable development and human rights. All the cases aim to show the role of doctors, nurses and others in building trust, understanding, mutually enriching structures, and cultures of peace. The six online video cases are intended to be used as the basis for group work and class discussion in both, formal and non-formal educational settings for health professionals and their students. Accompanying teaching notes are available for teachers and trainers. The materials are developed by nine organizations from Norway, Germany, Italy, Austria and the UK and are available free-of-charge. They are designed for European health professionals and students no matter where they live and work. The material is also useful for those who wish to do humanitarian or development work or who want to work with human rights or medical peace organizations. For the past ten years the Medical Peace Work project (MPW) has been working to educate health professionals about their role in violence prevention and peacebuilding. The project includes health professionals of all backgrounds and nationalities. To access the courses, go to www.medicalpeacework.org. We invite you to register your interest for our upcoming MOOC (massive open online course) on medical peace work. The 5th International IPPNW Conference "Medicine and Conscience - What do people need?" came at the right time, 70 years after the beginning of the Nuremberg Medical Trials. 400 participants and 40 speakers discussed the role of physicians and psychiatrists in National Socialism, prevailing ethical questions in medicine, and the role of health workers in creating a more peaceful society. After the conference, the Medical Peace Work partners held a workshop to discuss the future of the programme, in which they re-adopted their mission statement: “Enabling health professionals to contribute to all levels of violence prevention and peace building”. The Greek physician and founder of the Greek solidarity hospital “Metropolitan Community Clinic Ellnikó”, Dr. Giorgos Vichas, is to be awarded with an international prize for his medical peace work. The award will be presented this evening at the 5th International “Medicine and Conscience” Congress and comes with a prize of 3,000 Euros. The prize has been donated by the German affiliate of International Physicians for the Prevention of Nuclear War (IPPNW) and the European “Medical Peace Work” network. A second award (no financial prize attached) will be shared by Fikr Shalltoot, a nurse from Gaza and programme director of the NGO Medical Aid for Palestinians in Gaza, and the medical organisation Physicians for Human Rights Israel. Many Greeks are unable to afford medicine or to visit a doctor due to drastic austerity measures in the health system. Approximately 3 million people have no social security and have to pay for medical treatment out of their own pockets. Dr.Giorgos Vichas, a cardiologist, established a hospital for the poor during the so-called “financial crisis” in Greece in 2011, one of 40 solidarity hospitals in the country, of which there are 12 in Athens. He is an untiring critic of the “deadly austerity policies” of the so-called “three institutions” (formerly known as the “Troika”). He has not only directed his criticism towards the Greek government but also the European public, e.g. in the European Parliament in Strasbourg. The catalyst for Dr. Vichas was a patient with heart disease that was undergoing treatment for a second heart attack in the Spring of 2011 but had not visited the clinic for many months. It turned out that he had become unemployed and could no longer afford to pay for his heart medicine. He was suffering from a severe lungoedemata. Dr.Vichas was shocked. On December 15th he founded the solidarity clinic in Ellnikó with four other physicians. Since then the hospital offers free medical treatment and medicine for patients who are uninsured, unemployed or needy. The number of volunteers and doctors, dentists, pharmacists and therapists who treat people for free has now reached 200. Staff also offer free psychological support, baby food and basic articles for infants. These hospitals are life-savers for many Athenians. For instance, the solidarity hospital is the only place in Athens that offers cancer patients free chemotherapy, financed by donations. The clinic also distributes medicines to refugees since March 2016. Fikr Shalltoot will receive the second medical peace work prize for her incredible courage and humanity with which she led the Gaza team of Medical Aid for Palestinians UK during the attacks on Gaza in 2014. The award honours her dedication over many years to seek international media attention for the catastrophic humanitarian effects of the Israeli blockade of the Gaza Strip. Shalltoot shares second place with Physicians for Human Rights Israel. The physician’s organisation is to be honoured for their unflagging work over thirty years for human rights in Israel and Palestine and for improved health services, as well as for building bridges between the two peoples. In conjunction with the Global Health Summer School in Berlin (Germany) the MPW Network organizes a workshop on «What is Medical Peace Work?». Narrative case studies and new audio-visual teaching cases will be presented. This year’s Summer School will explore the relationships between political violence, trauma, empowerment and health in the light of the current refugee crisis. As future health professionals it is important to develop a basic understanding of trauma and trauma symptoms caused by “men made disasters”, develop trauma-sensitive skills and understand the cultural embeddedness of trauma as well as the social determinants of health and healing. Participants will gain a thorough understanding of issues related to trauma and refugee health and its determinants through interactive lectures and will learn more about the Medical Peace Work. The recipient of the Medical Peace Work Award 2011, Şebnem Korur Fincancı, who got arrested on charge of “terror organization propaganda” for participating in Özgür Gündem daily’s Editor-in-Chief on Watch campaign, has been released. We are very relieved about the decision to release her and call on the Prosecutor on Terror and Organised Crime to drop all charges against her. The first hearing will be held on November 8th, 2016. Prof. Dr. Sebnem Korur Fincanci received the award in 2011 for her courageous opposition to torture and human rights abuses. Dr Financi is a coroner, teacher and president of the Human Rights Foundation of Turkey. She has played a crucial role in establishing the Istanbul Protocol - the UN principles for the detection and documentation of torture. We cordially invite you to the international conference “Medicine and Conscience”. It will take place in Nuremberg, Germany, on October 14th and 15th, 2016. Each fifth year since 1996 a congress has been organized under this heading to commemorate the Nuremberg Trial against the Nazi doctors in 1946/47. This series of congresses is organized by the IPPNW chapter of Nuremberg, Fürth and Erlangen, together with the German affiliate of IPPNW. It deals with various issues in the fields of human rights, global health, the medical history and medical ethics. The 2016 congress “Medicine and Conscience: What do patients need?” will feature not only renowned speakers but also will offer a platform to up and coming scientists. Living in a world where new technologies abound and health systems are oriented towards profit, what can patients expect of us as health workers? How to protect their rights and to get the “right” medicine and health services they seek? What are the limitations of it? Aftereight years with the Medical Peace Work e-learning programme, what is coming next? How to go ahead with incorporating violence prevention and peace building in our medical/health curriculum and our daily work as health professionals? We are looking forward to an interesting and lively conference, which will broaden our view on difficult dilemmas in medicine and health, and give us new insights, ideas and food for thought in our day to day work. The jury of the International Medical Peace Award has come to a decision. The person/organization to receive the award of 3.000 Euros is still kept secret and will be announced at the International Conference „Medicine and Conscience“ in Nuremberg, Germany on 14th of October, 2016. We are happy to announce a Medical Peace Work Workshop at the next IPPNW Western Balkan meeting, May 6-8, in Belgrade, Serbia. Since summer 1998, medical students, doctors, representatives of local IPPNW groups and alumni of the student exchange programme Bridges for Understanding from Western Balkan countries and Germany come together in annual meetings to learn and discuss together about peace and conflict transformation. The aim of the project is to contribute to bridge building on the difficult road to reconciliation. Pegasus is an acronym built from the first letters Peace, Global Health and Sustainability. It stands also for a thought stimulating conference, convening leaders, change-makers, and participants from multiple disciplines to engage in discourse about actions and policies to improve unacceptable levels of poor health. Come out and be part of the conversation with Naomi Klein, Izzeldin Abuelaish, Peter Donnelly, and a line-up of other amazing speakers! Bruce Cockburn also scheduled to perform live! On the International Day of Peace (September 21st), the Medical Peace Work III partnership launched a case study collection to educate nurses, doctors, students and others on the health aspects of war, violence and armed conflict. The new case studies form part of the Medical Peace Work framework and depict challenging situations for health professionals in the search of preventing and reducing violence – as well as promoting peace, sustainable development, and human rights. They aim to show the role of doctors, nurses and others in building trust, understanding, mutually enriching structures, and cultures of peace. The twelve case studies are intended to be used as the basis for group work and class discussion in both, formal and non-formal educational settings for health professionals and their students. Accompanying teaching notes are available for teachers and trainers. The resources are available free-of-charge. The case studies, which are promoted worldwide by the Case Centre, were developed by nine MPW partner organizations from Norway, Germany, Italy, Austria and the UK. They are not only designed for health professionals and students who wish to do humanitarian or development work or who want to work with human rights or medical peace organizations. The case studies are valuable for all health workers, no matter where they work and live. The issues tackled in the case studies ranges from climate change and structural violence to the abolition of nuclear weapons. Case-based learning is a methodological learning approach in which students in groups try to understand a fictive or real case situation and to solve presented challenges. It enables active peer learning. Join our MPW partner Medact this year for 'Health Through Peace', a conference for health students and professionals to learn about, and engage with some of the most pressing peace and conflict issues of our time, including: nuclear disarmament; drones and remote warfare; the arms trade; the ‘War on Drugs’; gender, masculinity and conflict; the privatisation of war; climate change and conflict; monitoring the conduct and impact of war; and understanding the roots of war in the Middle East and Central Europe. Speakers include: Prof. Sir Andy Haines (LSHTM), Richard Horton (The Lancet), Andrew Feinstein ('The Shadow World', author) and Vivienne Nathanson (BMA). The MPW partner 4change has recently conducted an assessment mission on the Syrian conflict. They report that medical personnel and facilities are increasingly the target of attacks, particularly aerial attacks in Syria. In addition to having to meet the challenges of healing complicated injuries from barrel bombs, doctors and other health workers are faced with personal and patient safety concerns from these attacks. 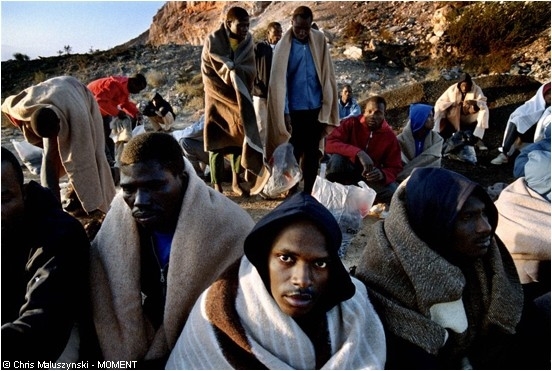 They are obliged to find and establish safe centres for taking care of the sick and wounded. These are now in caves, basements etc. to avert human and material loss. International attention must be paid to this blatant violation of international law, and world leaders must address this atrocity in a determined and systematic way. Medical Peace Work has gone into a third project round. It has been selected for EU-funding in the period 2014-2016. The new project aims to increase the MPW performance among health professionals through the use of case-based learning methodology. Ten partner organizations will collaborate to develop and to implement narrative case studies, audio-visual cases and a new case-based online course. In contrast to the existing seven MPW courses, the new material will be produced for group work and peer learning, both in formal and non‐formal education. Four of the partner organizations have former experience in collaborating through the MPW partnership. Six new members are included: IPPNW-Norway, Coalition for Work With Psychotrauma and Peace, Samaritan Austria State of Styria, 4-change, The Case Centre, and Medical Mission Institute Würzburg. The MPW3 project chart can be downloaded here. Since more than 10 years, an armed conflict is going on in Southern Thailand. This book presents different ways how health professionals not only try to mitigate the health consequences, but also work towards peace building and conflict transformation. The book is a follow-up of a peace-health workshop for local health professionals which took place in Krabi/Thailand in December last year. Canadian Physicians for Research & Education in Peace (C-PREP) and Physicians for Global Survival (PGS) invite to this outstanding peace-health conference. Major themes include Peace, Global Health (International Health & Ethics, Marginalized Communities) and Sustainability, with sub-themes of research, advocacy/activism and policy development. Don’t miss it! The 21st World Congress of International Physicians for the Prevention of Nuclear War (IPPNW) will take place in Astana (Kazakhstan) under the heading “From a Nuclear Test Ban to a Nuclear Weapon Free World: Disarmament, Peace and Global Health in the 21st Century”. The student congress will run on August 25 and 26. The main IPPNW world congress is scheduled for August 27-29. A special one day excursion to the former nuclear test site area close to Semey and Kurchatov city is offered for August 30. Medical Peace Work will offer a workshop on educating health professionals in peace and disarmament work. Between 1900 and 2006, campaigns of nonviolent civil resistance were twice as successful as violent campaigns. In their study Why Civil Resistance Works American political scientist Erica Chenoweth together with Maria J. Stephan found out that major nonviolent campaigns have achieved success 53 percent of the time, compared with 26 percent for violent resistance campaigns. According to Erica Chenoweth there are two reasons for this success. First, a campaign’s commitment to nonviolent methods enhances its domestic and international legitimacy and encourages more broad-based participation in the resistance, which translates into increased pressure being brought to bear on the target. Second, whereas governments easily justify violent counter attacks against armed insurgents, regime violence against nonviolent movements is more likely to backfire against the regime. Potentially sympathetic publics perceive violent militants as having maximalist or extremist goals beyond accommodation, but they perceive nonviolent resistance groups as less extreme, thereby enhancing their appeal and facilitating the extraction of concessions through bargaining. Now you can apply to next World Summit of Nobel Peace Laureates and participate workshops hold by the nobelists themselves. Nobelists consider the youth to have a major role in the future's peacework. We as the IPPNW's European student representatives want you to inform your fellow students about this nation wide. Conference will be held in Warsaw, Poland, during 21.-23.10.2013. Because the applying process is global, each state should send just one e-mail which includes all the resumes from that particular country. One way of doing this nationally, is by creating a new email-address to which all the national resumes should be sent. To make it more transparent, the email-address should be administered by at least two people. One which is your country's national student representative (NSR). The other person can be a doctor with some experiences in peace work. 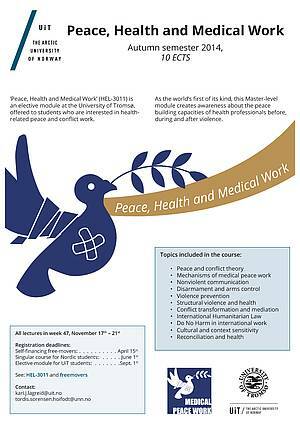 ’Peace, Health and Medical Work’ (HEL-3011) is an elective module at the University of Tromsø, offered to students who are interested in health-related peace and conflict work. As the world’s first of it’s kind, this Master-level module creates awareness about the peace building capacities of health professionals before, during and after violence. This information has been added to the respective course certificates. If you have downloaded one certifcate earlier without this information, please login into the respective online course and download the certificate once again. We are glad to announce that Medical Peace Work got this new website. Other teaching resources will be made available soon. IPPNW organizes its 22nd European Students Conference in Berlin, from April 12th - 15th. 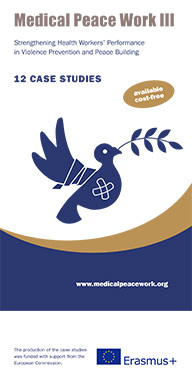 The main topic of the 2012 conference is "Medical Peace Work".